This past week, a scientific research team led by David Williams of Arizona State University published a new geologic map of Vesta, one of the largest asteroids in our solar system. Using the latest high-resolution images taken by the Dawn spacecraft from 2011 to 2012, they were able to create a detailed image of Vesta’s surface, with all its many peaks and valleys. But the map they produced, which was published in the December issue of the journal Icarus, also tells us much about the asteroid’s long and tumultuous history. The scientists were able to figure out roughly when certain areas of the asteroid’s surface were last modified, by impacts from other objects, for example. The map reads partly like a history for how this crater-covered, potato-shaped rock got the way it is. 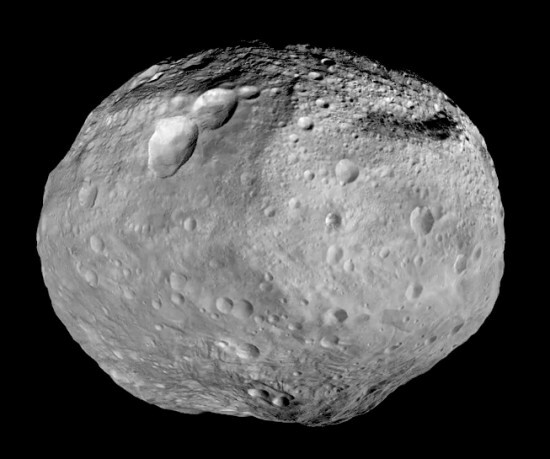 Vesta is just 326 miles in diameter, but it is still the second most massive asteroid in our solar system. It has an age of 4.5 million years, and the colored regions in the map above indicate how the asteroid changed during that time. 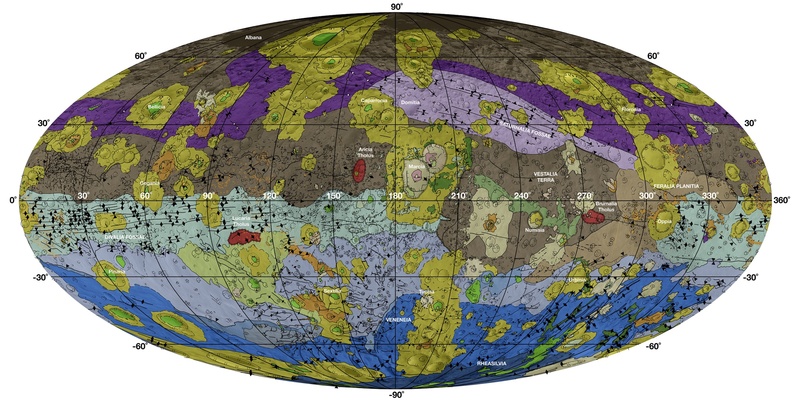 Brown is the oldest area, followed by the purple and light blue regions, which consist of craters caused by massive impacts over one billion years ago. In fact, the potato shape of the asteroid resulted from the shock of these impacts. Younger than these regions are the light purple and dark blue areas, which consist of the inside areas of the impact basins created by the earlier collisions, which have crumbled and shifted over time. Younger landslides caused changes to the regions marked in green and yellow. In the middle of the map, you can also find the Marcia crater, which was created during the same timeframe by another impact. This crater is part of a series of three craters called “Vesta’s Snowman”, since all three are stacked on top of each other. You can see it more clearly on the photograph of the asteroid below, in the top left. It just goes to show, an asteroid is much more than just a big boring rock in space. That rock has had a long and vibrant history, and there’s a story behind every crater and mountain. Through satellite imagery, and cartography, we can finally begin to understand this past. You can read more on this at Wired’s Map Blog (a great resource), and Earthsky.org. My calendar and my cold fingers tell me it’s November, which means it’s also National Novel Writing Month (or NaNoWriMo). This month-long challenge is open to anyone, whether an experienced novelist or someone who has never, but always wanted, to write their own novel. The NaNoWriMo nonprofit organizes and facilitates the event through their website (http://nanowrimo.org/), on which you can sign up, track the progress of your novel, interact with other participants, and finally upload your completed novel at the end of the month. The site boasts that thousands and thousands of people participate every November, many of them entering December as first time novelists. Let me first say that I think this is a really good way to get people motivated to write. Having a specific goal to meet by a definite deadline, along with an online community to provide support, is helpful for lots of people who desire to write but struggle to actually put words to paper. There are even prizes available, such as paperback copies of the participant’s novel. From there, the novelists can, and many do, go on to publish their novels. The one requirement for a participant to complete the challenge is to create a novel of 50,000 words. According to the website, this number was chosen because it is about the length of a short novel (such as the Great Gatsby), and it’s doable for just about anyone. Translated to a page count, 50,000 words is about 175-200 pages, and I think this is a good goal for a first time writer who is still learning about pacing and plotting over the course of a long story. In contemporary fiction, and especially with genres such as fantasy, the trend lately is for page counts to go up and up, as if that were a marker of greater significance. The books in A Song of Ice and Fire, for example, are all upwards of 850 pages. But some of the best stories I have read in my life have also been on the shorter side, and they often boast the advantages of tighter plotting and an economy of characters. So I agree with the NaNoWriMo figure of 50,000 words for a novel. However, I think it would prove challenging for the average person, with work and family responsibilities, to write this many words in a month. That’s over 1,500 per day, on average, and does not even include time spent on planning and editing. While some people, when faced with an ambitious goal and a tight deadline, will rally and succeed, I think a significant number of people will become deterred and discouraged. Worse, they might be turned off from writing completely if they cannot meet the goal of 1,500 words a day. That’s why I’m proposing a new writing challenge for November: Write something. Every day. Even if it’s just a sentence, write something that goes towards a short story or a novel you hope to complete, and don’t feel bad about how little you wrote. The goal is not about volume, but forming a daily writing habit. Once writing becomes a habit, it gets easier to put more and more down on the paper as time goes on, but if you’re just starting out and trying to find time in a busy schedule, I think the daily aim of “Write Something” is a good start. As for me, I am not participating in the normal NaNoWriMo challenge, because I already have a 3/4 finished novel that I would really like to buckle down and complete. I have 72,000 words written, and I expect that it needs another 10,000 to 15,000 for the story to wrap up. That’s a goal I think I can manage if I push myself to write every day in November. You’d be surprised how much you can write when your aim is just to write “something”, because once the creative juices start flowing, the words flow quicker. Sometimes I have sat down to write just a sentence, and churned out a paragraph, and other times a paragraph became a page. Write something, anything, as long as it’s fiction, and see where it leads you. There are no prizes for my Write Something challenge, unfortunately, except for your own self-satisfaction. Now get writing!